Dissatisfaction is growing in Guangdong over the suppression of the Cantonese language and culture in the public sphere. 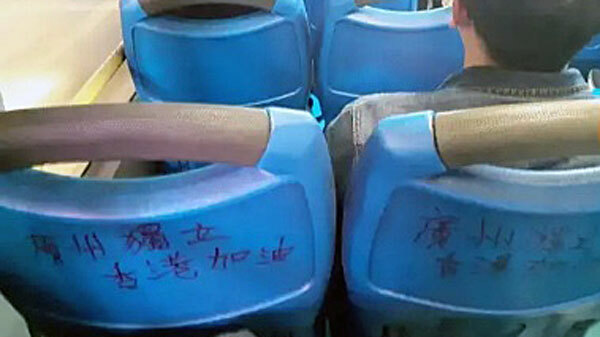 Slogans have been written at the Dayuanshuaifu and Xinhong Gardens bus stops as well as at the back of bus seats. Stickers have also appeared. Beijing (AsiaNews/RFA) – Posters and graffiti have appeared on the streets of the southern Chinese city of Guangzhou calling for independence not just for neighbouring Hong Kong, but for Guangzhou itself, which shares the Cantonese language and culture with the former British crown colony. Graffiti phrases like "Independence for Guangzhou, Go Hong Kong!" have been photographed in a number of public places in the city, which is the provincial capital of Guangdong province, and lies at the heart of the Pearl River delta economic area. In mainland China, the ruling Chinese Communist Party simplified large numbers of Chinese characters after coming to power in 1949, whilst the original characters are still taught in Taiwan and Hong Kong, which weren't under communist control at the time of the reforms to the writing system. 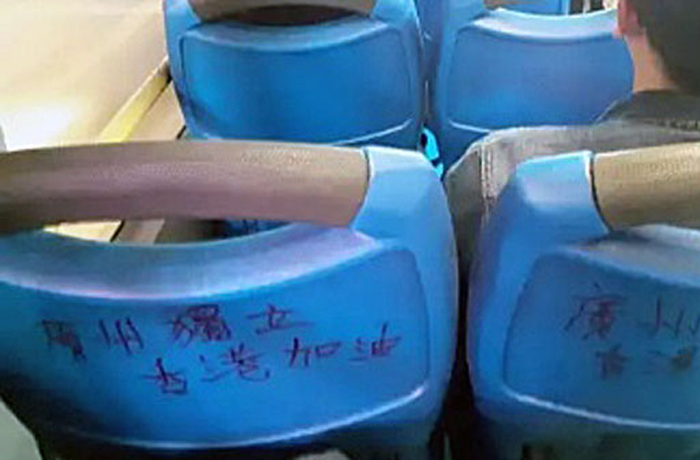 The slogans have been spotted at the Dayuanshuaifu bus stop, the Xinhong Gardens bus stop, and on the backs of bus seats, with the words scrawled in different colour marker pens in traditional Chinese characters of the kind still taught and used in Hong Kong. Local human rights activists have reported that stickers have appeared in different locations across the city in recent days. A Guangzhou resident surnamed Wang said the slogans are appearing after several years of government suppression of the Cantonese language and culture in the public sphere, which has prompted growing discontent among Cantonese speakers. "A lot of the younger generation don't even know how to speak Cantonese anymore, and there are fears that Cantonese culture will be wiped out," Wang said. "There is a huge awakening around our culture right now”. Cantonese speakers in Guangdong province, which gave the dialect its name, are culturally very connected to those living across the internal immigration border in the former British colony of Hong Kong, where Cantonese has been an official language of government and the lingua franca of most residents for generations. "Cantonese culture is directly connected with Hong Kong, because it has been wiped out in favour of Mandarin [here in mainland China]," Wang said. Flash mobs showed up in public places wearing white as a sign of protest, sparking similar actions in Hong Kong. However, activists reported intimidation by state security police in the wake of the demonstrations.